Best Vegan Cookbook Reviews - find the right vegan cookbook Vegans Eat What? Tal Ronnen became known to the world at large when he prepared the vegan meals for Oprah’s show in 2008 for a 21 day cleanse. In 2009, he followed with his first cookbook, The Conscious Cook, subtitled “Delicious Meatless Recipes That Will Change the Way You Eat”. Author and entrepreneur Tal Ronnen is well known in the vegan chef world, having worked at various recognized restaurants. He also catered Ellen deGeneres & Portia de Rossi’s wedding in 2008, Ariana Huffington’s party at the 2012 Democratic National Convention, and prepared the first vegan dinner for the US Senate in 2014. In 2013 he opened his restaurant, Crossroads, at the corner of Melrose and Sweetzer Avenue in Los Angeles. 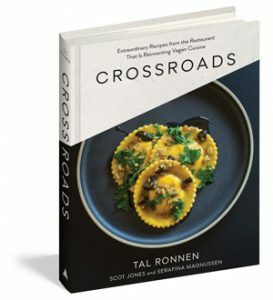 He is well respected in the non-vegan world of chefs as well, as is evidenced by the forward in his book, written by Michael Voltaggio, owner and chef of Ink restaurant, a meat centric eatery and competitor just down the street from Ronnen’s Crossroads restaurant. Crossroads is a beautiful book, hardbound and with gorgeous photos. If you are a cook who wants to create stunning, gourmet restaurant dishes, this book will show you how to do that. Ronnen has created unique recipes that use various ingredients in unexpected places, such as using figs in caponata. Feel free to experiment as you use this book! While we wouldn’t recommend this book for a beginning cook, the recipes are clear and easy to follow albeit lengthy and perhaps too complex for the beginner cook. For music fans, the restaurant Crossroads is named after the legendary blues song “Crossroads” by Robert Johnson. This song has been reprised by musical greats such as the group “Cream”. Ronnen writes that the word “Crossroads” has special meaning for him, as it is “the place we’ve all been where we examine the choices and encounters that shape our life experience”. Ronnen has incorporated this approach in the dishes presented in his cookbook, and no doubt, in his restaurant as well. We tried recipes that included Sweet Corn Risotto with Buttered Leeks, Cherry Tomatoes, and Tomato-Sherry Cream Sauce, Spaghetti Squash Noce Moscata, Grilled Garden Vegetable Lasagna with Puttanesca Sauce, and Mushroom Farro Soup. We are sharing Spaghetti Squash Noce Moscata below for your dining pleasure. Drizzle the flesh of the squash with the oil and season generously with salt and pepper. Place the squash halves, cut side down in a 9-by-13 baking dish or sided cooking sheet. Roast until the squash is golden and tender when pierced with a knife, about 45 minutes. Remove from the oven. Put a saucepan over medium heat and add 2 tablespoons of the butter substitute. When it has melted, add half of the shallot, half of the garlic, and the nutmeg and cook, stirring, until the butter substitute starts to brown, about 1 minute, keep a close eye so it does not burn. Pour in half of the sherry and let the alcohol burn off for about 1 minute. Add the marinara sauce, season with salt and pepper and simmer for 3 to 5 minutes. Cover the sauce to keep warm. Put a large sauté pan over medium heat and add the remaining 2 tablespoons butter substitute. When it has melted add the remaining shallot, garlic and sherry and cook stirring, for 1 minute to soften. Add the spaghetti squash and sauté until well coated and heated through, 3 to 4 minutes. Season with salt and pepper. Pool a ladleful of the sauce in the center of each of four individual plates. 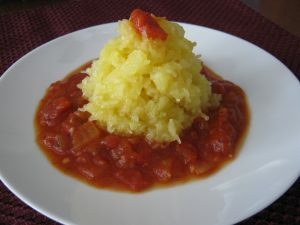 Using a pair of tongs, twirl one-quarter of the spaghetti squash tightly, twirl one-quarter of the spaghetti squash into a nest and mound on top of the sauce, like a pile of noodles. Repeat with the remaining squash. Top the squash with the remaining sauce and sprinkle with parsley and Walnut Parmesan. Using a truffle shaver, thinly shave the walnuts and put in a bowl. (Alternatively, use a microplane to coarsely grate the nuts.) You should have about 1 cup. Coat with cooking spray and toss with the nutritional yeast flakes, salt and pepper. The Parmesan keeps covered in the refrigerator for up to 1 month.